I would have always thought that making your own cured salmon would be technical, time consuming and require some obscure instruments; this however was none of those! Yes, it won’t be ready for 48 hours from your start time, but in terms of prepping and time spend in your kitchen it really is minimal. The only equipment you will need it a knife, bowl, blender, cheese grated and baking tray – which I’m sure most of you possess. My only recommendation would be to invest in some goggles (swimming would do), as grating the horseradish is a painful experience – I actually thought I was blind! I also have to confess that this recipe is not a hmwm original, but inspired by my absolute idol Jamie Oliver. However now that I have cured my own salmon I am inspired to do it again with a hmwm twist. It really is incredibly easy and so delicious. 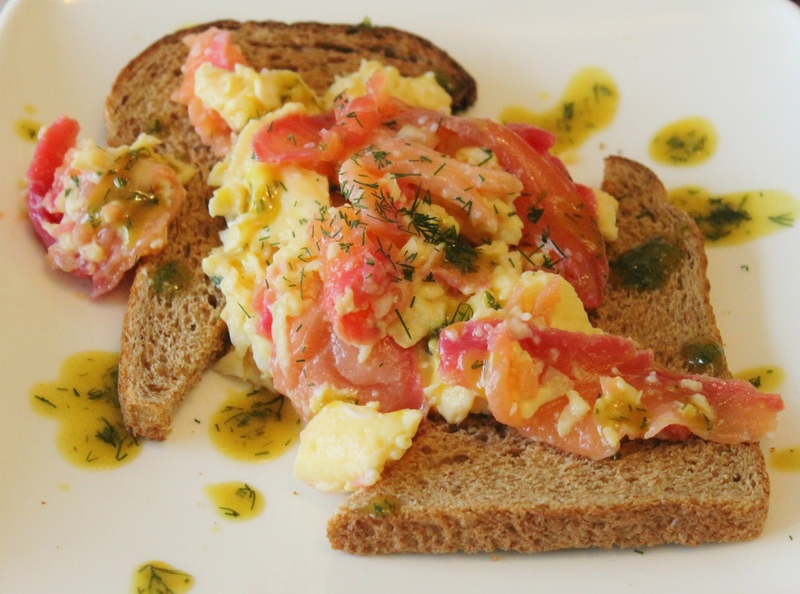 We had friends for dinner and served this with heaps of salad and lovely bread, but it also made some mean scrambled eggs for breakfast and super cream cheese bagels for lunch, so you can enjoy it again and again! To make the marinade, blend together the beetroot, citrus zests and juniper until smooth. On a large baking tray, lay out the salmon skin –side down and smother in the marinade. Wrap the salmon in a double layer of greaseproof paper and then wrap tightly in cling film. The next day, remove the salmon from the fridge and carefully unwrap it. Hold the salmon over a tray and wash the marinade off with small splashes of water – you shouldn’t need more than about 100ml as you just want to get rid of the excess. For the herb cure, mix together the chopped herbs, grated horseradish and gin. Pack the cure all over the salmon with your hands, making sure it’s evenly spread. Again, wrap it in a double layer of greaseproof paper and cling film and then return to the fridge for another 24 hours. 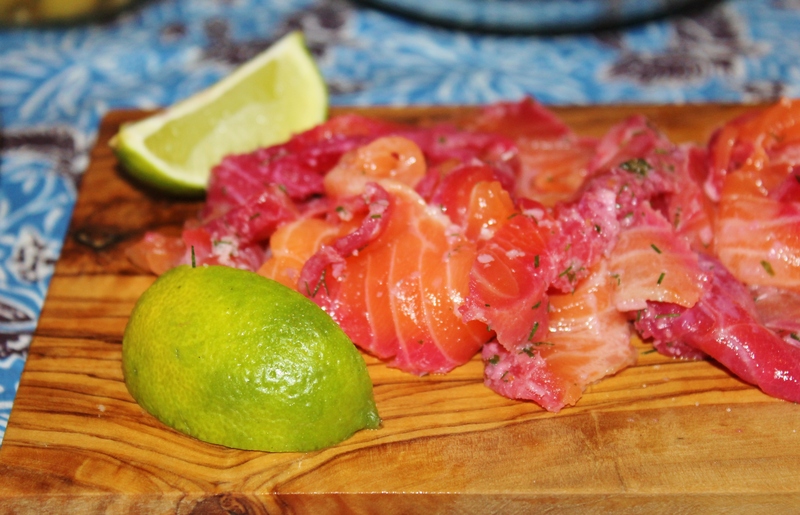 The next day you simply need to remove the salmon from the fridge, un-wrap and finely slice with a very sharp knife – and Bob’s your Uncle, beautiful cured salmon! I want this in my belly… please come make it for me! Looks delicious! I love the idea of the “double cure” I bet that adds a real depth of flavour. Thanks for sharing! Ah “beetroot,” the way I know you’re not from the US;) Looks good, to be sure. Do they not eat beetroot in the US? We call ’em beets, and they’re definitely not as common a menu item as in the UK or New Holland. This is a dish I have to try. I always like cooking salmon for family gatherings but I’ve never come across one with beets, horseradish, and gin. And I ordered beet seeds last month to plant in this year’s veg garden! Horseradish is a weed in my gardens so no problem getting that. Junipers grow wild near here by Lake Superior. Any particular gin recommended in this recipe? How lovely that you have all that beautiful produce on your doorstep! I just used Gordons gin, but any variety will work well.